This is a very long post with lots of scans ... so brew a cup and settle in. 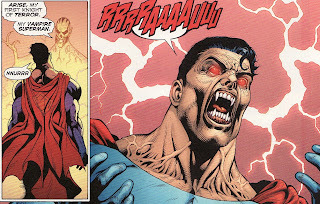 I read Final Crisis #7 on Wednesday afternoon and was absolutely thoroughly confused. But rather than rush to post a review, I decided to wait a bit and see if anything settled in. I am glad I did. I reread the issue last night and it suddenly made a lot more sense. Not that I think I understand it all ... but at least the timeline of the events made more sense. Now I am sure that there will be a great debate about Final Crisis for a while. Morrison is not for everyone and this was Morrison at his most Morrison-iest. So there will be plenty of people who will hate it. For me, when you put the whole thing together, there is no denying that are more original ideas and concepts sown in this 7 issue mini-series than in any other 7 issues I can think of. Hell, there is more here to think about than in some titles' years of runs. My one problem (if it is a problem) is that given the sheer number of ideas and plot threads stuffed into the book, many do not get explored or explained as much as I would like. Others get explored much more than I care for. 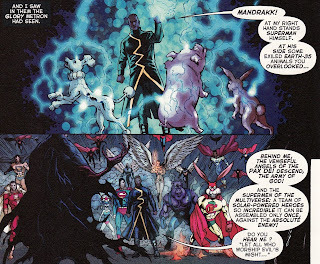 For example, I would have liked the Mandrakk threat fleshed out much more than it was. Mandrakk was the big threat in this book and yet he only appears for 5 pages of the whole series. So why devote so much time to the asian super-team or the kidnapping of children in the early series? Pages devoted to Nix Uotan's job as a pizza delivery boy? If you can't figure out what's going on, it's frustrating. Long sections or splash pages of things that in the end don't matter *a lot* can feel pretty lousy when you are starving for some exposition. As a reader of Morrison, you just have to let the ideas wash over you and try to piece it all together in the end. Okay Anj ... get off the soap box. The big thing for me with this issue was understanding that this issue was being told from 4 pretty discrete time points. Point A - the immediate aftermath of Batman's death. Point B - a period of heroic preparation in the watch tower. Point C - the big battle. And Point D - the post big battle reality. Making sure I understood what point in time a panel was from helped me tremendously. I will be referring to these points throughout the review. The issue starts at Point B. 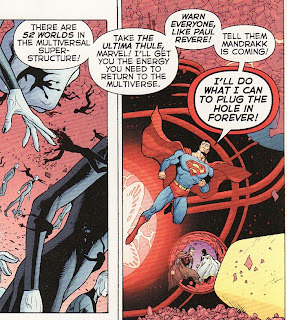 The Question, the new Global Peace Agent, is riding in the Ultima Thule ship from Final Crisis:Superman Beyond gathering up the Supermen equivalents from the 52 universes, forming an army that will eventually face Mandrakk. Remember at the end of Beyond, Superman tells Captain Marvel to be like 'Paul Revere' and warn everyone that Mandrakk is coming. Looks like he is doing just that. The first one we see them recruit is an African-American president who also happens to wear the big red S. That's a nice touch given the recent election. We also see the Watchtower during Point B as well. An amalgam of the JLA satellite and the Fortress of Solitude, here the surviving heroes and villains are busy working on the ultimate solution to the problem ... a veritable miracle machine. Swirling around the Watchtower is simply a morass of chaos, a universe of Darkseid as he dragged reality to the pit with him. So already I was a bit confused. How did we get there? Who is doing the voice overs? And while it was cool to see Kara wading in against the suddenly crazed 'Metal Men of Earth 44', why did there arrival and attack warrant this space? Was it just to show how cool an idea of a Metal Men/JLA would look like from Earth 44? This is what I call 'a throw away idea'. We will never see these guys again. But I bet Morrison thought of them one day and said 'let's put them in somewhere.' And while they are an interesting concept, I would much rather hear more about how the Watchtower got there, how is it safe, who is on it? Well, we eventually learn that the voice-over is from Lois Lane who is writing 'the last story', the events around the end of this conflict with the plan to rocket it into the chaos around them in case Superman's plan fails. Maybe that way someone may find it and eventually read about the strength of humanity. 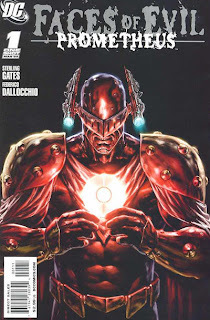 We are suddenly brought to Point A - the end moment of Final Crisis #6. 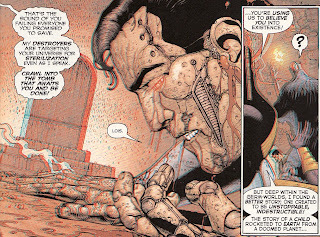 Superman confronts Darkseid but realizes that the dark god controls all the humans on Earth. There is no way to fight Darkseid without harming innocents. Darkseid actually loads the Radion bullet into a gun with the plan to shoot Superman. He fires and misses just as the Flashes show up with their piece of the plan. 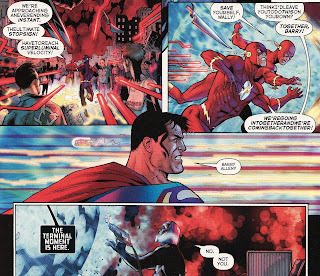 Barry at some point learned that the best way to defeat Darkseid is to bring death to him. Barry and Wally outrace the Black Racer leading him right to Darkseid. Darkseid shoots the Radion bullet but misses Superman; the bullet flies into the time stream the Flashes have opened up moving into the past ... where it will kill Orion. That is the very bullet that Batman later uses to shoot Darkseid, an interesting time loop. The Black Racer seems to claim Darkseid, ripping him from Dan Turpin's body. We know this because we see the physical body of Turpin but with human eyes, rather than the glowing red eyes we have seen since Darkseid manifested. Again, this is not explained outright ... just inferred and could easily be missed. Was this a worthy story for the return of Barry Allen? The idea of outracing Death and leading him to your enemy is very cool ... no doubt. But Barry was such a small part of the overall series. I didn't want him to return in the first place thinking it cheapens his COIE sacrifice and suddenly turns back the clock on Wally. While this was a huge part of defeating Darkseid, it was touched upon in such a small way, I didn't get any of the goose bumps I should have from the return of such an icon. With that piece of the story done, we are shifted back to Point B where we see Superman and Supergirl looking at the schematics of the Miracle Machine, a blueprint Superman needed to remember from just his brief look at the device with Brainiac 5 last month. Heroes and even villains like Luthor and Sivana are shown helping put the pieces together, a machine to calculate the Life Equation, the obvious opposite of the Anti-Life Equation. But back to Point A we go and the war on Earth continues. We see that Checkmate simply gets overrun by the Justifiers. We see that Lord Eye goes insane and detonates the spatial tunnel the Atoms were trying to create to a new universe. And we see the JLA satellite out of power and falling to Earth. 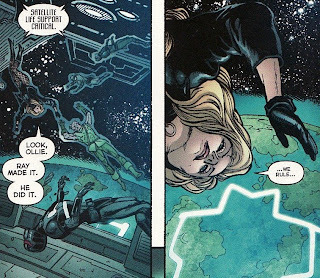 But we also see that Black Canary's team was successful in their small part in the big picture. The Ray was able to escape the satellite and seems to be broadcasting the Mister Miracle sigil to the whole world thus releasing mankind from Anti-Life submission. The Question, who was at Checkmate headquarters at the time of the explosion, says that Mister Miracle's mother boxxx was able to boom tube out most people to safety. 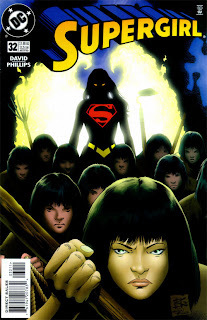 She sent them to the Kamandi universe where they could then begin their mission of finding the Supermen. 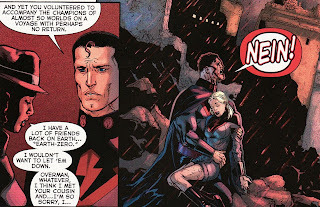 The Question tells Overman about the death of Overgirl. While the panel to the right obviously cannot have happened, it does show the grief Overman would have for his cousin's death. It is yet another riff on The Pieta and (I thought) a little nod to Kara's death in COIE #7. The power of story is a running theme throughout many of Morrison's book including this one. We see that the events of Point A, the war with Darkseid on Earth, are being told like oral history to the surviving children on the Watchtower by Supergirl and Wonder Woman. Good old Streaky seems interested too. Thank goodness that characterization of Supergirl is over. 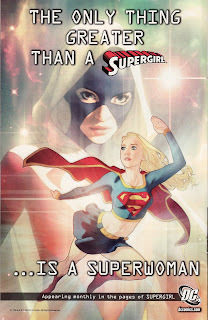 I thought Morrison really made Supergirl a powerful symbol of strength and goodness in this series. She is caring. Wonderful. And we see more of Superman's preparations. It looks as though he is shrinking and freezing the survivors on the Watchtower in hopes of reviving them later. Why should they be part of the warfront with Mandrakk? Shrinking Earth's population in ice cube trays! Another Morrison throw away idea, one that I rather like. But we still haven't heard the last of events of Point A on Earth. 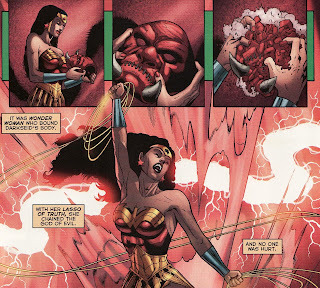 After suffering through a whole series of being Darkseid's slave, Wonder Woman finally has a brief moment. Freed from the morticoccus bacterium (I guess by Frankenstein somehow), she crushes her Fury mask in disgust and binds Darkseid in her lasso. This is one area where I truly felt lost. How did she get free? Why the need to bind Darkseid if he is already dead at the hands of Black Racer? The piece of this crisis on Earth is over. But the Darkseid is still falling, ripping the guts out of the multiverse as he falls. We are now at Point B. The humans frozen, the Miracle Machine built, Superman confronts the remnants of Darkseid at last. Darkseid has basically manifested as surrounding environment of chaos, a vibration of doom. 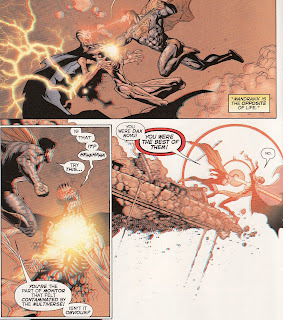 Superman tells Darkseid that every vibration has a counter-vibration that will cancel each other out. 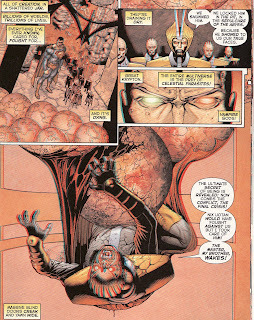 Superman then sings ... disintegrating Darkseid, collapsing what little is left of time/space around him. 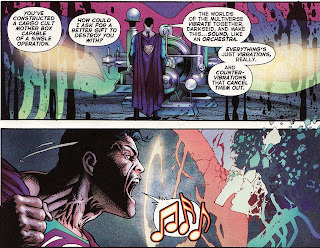 Superman sings to defeat Darkseid's universal plot. Say that again. That is wonderful Morrison looniness ... a mix of genius, Silver Age fun, and insanity. Many won't like such a bizarre end. I thought it was wonderful. What other hero could sing to victory? Sitting in the void, Superman finds Element X, the fire of the gods, in Metron's seat and puts it into the Miracle Machine. Well, maybe Superman isn't alone. It looks like he planned to have Kara at his side. But she has been defeated by the vampiric Ultraman. But while alone now, the cavalry is about to arrive. 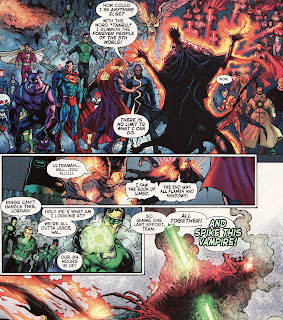 Mandrakk's destroyers arrive to Earth (to be honest I thought Earth was destroyed here ... but I guess it still exists) and their arrival provides a path for the Green Lanterns circling Earth to enter the fray. And then Nix Uotan, the newly appointed Judge of All Evil, arrives. And with him, three animals from Earth-35 which he mutates to Captain Carrot, Pig Iron, and Yankee Poodle. And he also has brought an angelic army ... the Pax Dei. And the Green Lantern Corps arrives. And the multiverse's Supermen arrive. Wait a minute .... Captain Carrot on the front line with Superman to face off against the Dark Monitor!? Again, you either think these flashes of Morrison are genius or idiotic. I think the former. Tawky Tawny guts Kalibak. And Pig Iron helps save the universe. Unbelievable. Simply fantastic. And here is the crazy part. This whole mini-series was built with the expectation of a showdown with Mandrakk. And that showdown took 3 panels, 75% of one page. The Supermen burn Mandrakk with complete heat vision annihilation. 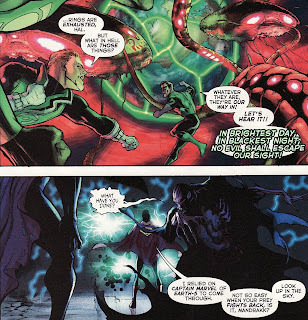 The Green Lanterns deliver a stake through Ultraman's heart. Did we really need pages of Turpin beating on the Mad Hatter if this ... the climax ... gets 3 panels? It depends on what you want in comics ... a slow and maddening build to a crescendo of a single cymbal clash .... or pages of slugfest action. Both have their allure. Finally, we reach Point D. With Mandrakk defeated, Superman activates the Miracle Machine (off screen, of course) and saves the multiverse. Lois says it best: 'we saw the best' of humanity as they struggled to victory. "We rebuild ... we continue. Earth endures." Nix Uotan takes his place as the head Monitor. The Orrery is being repaired. The New Gods will go to Earth 51 to guide that destiny. He then declares that the Monitors will now cease all contact with the germ worlds. No more interference. And it is true. There will be no interference. This was the final crisis of their culture. Superman's wish was for 'only the best for all of us'. Somehow that means the dissolution of the Monitors and their world. We see the panels slowly moth eaten away by whiteness. And then we see Nix Uotan awaken again as a human in bed. The last pages show an elderly Anthro finally passing away. If anyone is still reading ... bless you for wading through my rants. Just a bit more I promise. So what do I think of all this? In the end, I am going to say that I liked Final Crisis. I desperately wanted to love it. But I can't go that far. First off, how is this post-FC universe different? We are still existing in a world with 52 universes and the same characters. Sure there is no J'onn. No Batman. No Monitors. No New Gods. And Barry is back. But really all of those things could have happened outside of a big event. The DCU does not feel that different now. And isn't that what Crisis events are supposed to do? Really shake things up? But was it a good story ... really that should be the ultimate question. Wild concepts, multiple overlapping storylines that eventually knotted, general craziness with unreal innovation, mining the depths of the DCU (Yankee Poodle?? ), the ultimate hero Superman saving everyone with an earnest wish... that part was good. Incomprehensible pieces, threads given heavy emphasis that shouldn't have (the kidnapped kids, the Chinese super teams), threads given heavy emphasis early and dropped later (the Libra one particularly was vexing), threads that should have heavy emphasis but didn't (the return of Barry freaking Allen) ... those things were bad. And they weren't just bad, they were frustrating. And the industry issues ... delays, Jones unable to keep up with art, multiple inkers on this last issue, mini-series playing key roles still not finished ... those things were also bad. But for a grizzled reader like me, a guy who has been reading comics for 3 decades and seen it all ... well, when I get surprised or caught off guard or when a moment is so powerful or vivid that I am moved a little ... well that is good art. And there were those moments here ... plenty in this issue alone. And let's not forget, Supergirl really shined here. This mini-series has been a bit muddy for me to completely comprehend. Part of that may be my unfamiliarity with many of the magical characters. I don't know many of their origins, powers, or background stories. As a result, I might be grading this lower than Shadowpact fans might. But bear with me. We open with Rama Kushna (as an agent of balance) trying to birth a chaos event from Nanda Parbat to set things right. The main storyline picks up right where last issue left off, with Lord Satanus defeating Neron in battle and becoming Ruler of Hell. Neron's forces were the tormentors in Hell, doling out punishments for the damned. Now depowered, Neron's troops are suddenly on the receiving end. Satanus takes on the regalia of his new post while his charred sister Blaze literally crawls into the skin of Lilith. The two have a discussion on how they will run Hell. While the damned are currently having fun flaying Neron's troops ... that can only last so long. Where will the inhabitants of Hell turn their wrath too once all of the old regime has been expunged? Towards Satanus or on each other? To ensure that nothing else tips the scales one way or another, Satanus completely closes all pathways from Hell to the outside world - both in and out. In the meantime, the ancillary players begin to realize that this war is nearing an end. 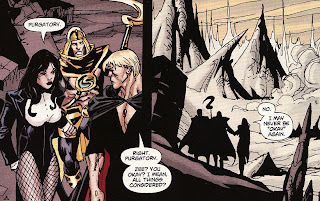 Shadowpact are told by Zauriel to head to Purgatory which is suddenly a safe zone in the afterworld. 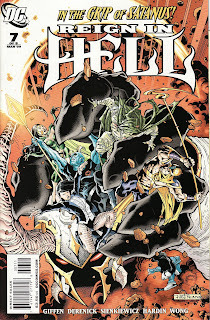 Zauriel implies that his resistance movement in Hell is done. Dr. Fate finds himself trapped in Hell. 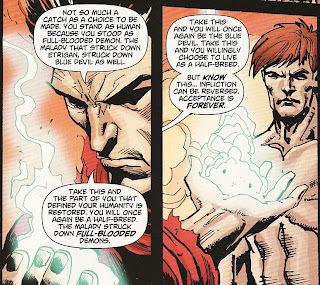 Blue Devil has a choice to make - remain completely human (he was stripped of his demon essence by Satanus' ploy) or choose to be Blue Devil again, albeit as a half-breed, a demon/man. Black Mary drains the immobilized Lobo of his powers. And Zatanna's group finds themselves drained and near defeat. They run into Rose and Yellow Peri who tells them that they also should run to Purgatory for shelter. 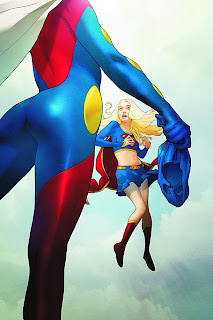 But let's face it, I am reading this series because I want to see what Giffen has in mind with Linda Danvers. And this issue has made me lose hope. This is not going to end well for one of my favorite comic characters of all time. She has joined Dr. Occult on his mission to get out of Hell. The two of them have been told by Rose to head to Purgatory for sanctuary (sounds like a running theme). 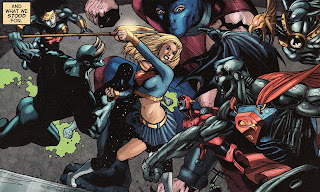 Occult comments that there is 'all kinds'a crazy' behind Supergirl's eyes. Already, you can sense a disdain that Giffen has for the character. The two run into some depowered Neron flunkies. Linda judges them and immolates them until nothing is left but there bones. 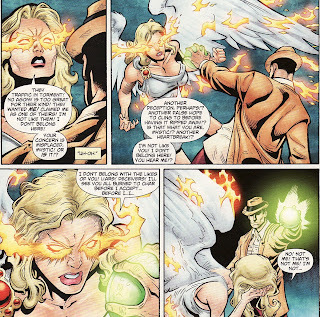 It is true that as the Earth Angel, Supergirl was the angel of judgment. But Occult is sort of struck with how easily she kills seemingly defenseless and powerless beings. Linda doesn't take kindly to that and in an almost paranoid rage begins accusing him of working for Hell, plotting against her. He holds up his symbol as a shield but as she looks into it, she becomes saddened saying that what she sees is not who she is. She flies off. 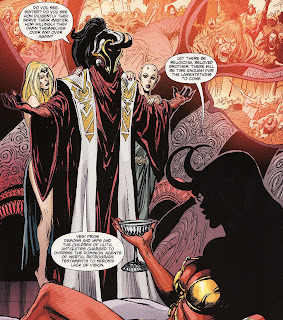 Occult runs into Zatanna's group near the gates of Purgatory. 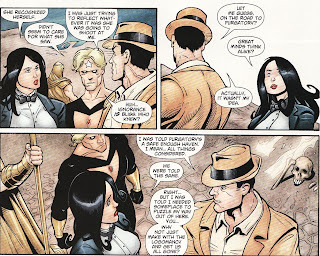 Zatanna explains that Occult's symbol showed Linda a reflection of who she was. Unclear of what to do next, the group trudges off for shelter. This story seems to be wrapping up with the new regime tenuously in place. My guess is that the 'magical' realm will not like Satanus being in charge and that we are in for one more overthrow. My big concern is that Linda Danvers will be the person to overthrow him. Throughout this series she has been portrayed as hot-tempered, confused, impetuous, and lethal. My guess is she will think she is doing something good by bringing her judgment and good intentions into Hell. But I don't want Linda to be the Queen of Hell. One of the things I loved about PAD's run was that Linda was a very complex person, tainted by evil but striving for redemption. 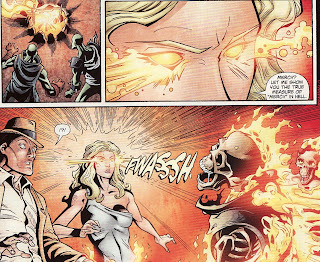 She defeated the Carniverean in Supergirl #50 more through love and forgiveness than with brute strength and holy fire. She deserves better than this. 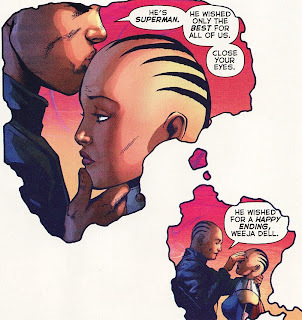 And yes, I understand that at the end of the Supergirl run she felt used and abused by god. That she went looking for a place where a burned out shell of a soul was a plus not a minus. But to me she was a hero. She was someone human, with human frailties and uncertainties, who simply tried to do what was right for others. No one sacrificed more for the good of others, despite the personal anguish it would cause, than Linda Danvers. Maybe to others she is a throw away character from the 90's who is suddenly going to be a cooler 'bad girl'. But I think this is pandering. And it saddens me ... sickens me. I'll say it again ... Linda Danvers deserves better than this. 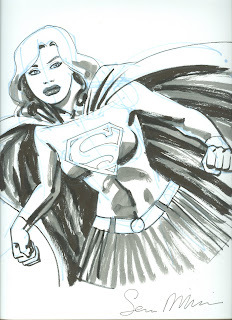 The Superwoman mystery continues to getsome buzz within the industry. First, this house ad is in a bunch of DC comics this week, including Final Crisis #7. Hopefully that will garner some interest in the title. And then, on Newsarama, Sterling Gates discusses the Superwoman identity guesses posted there earlier this month. 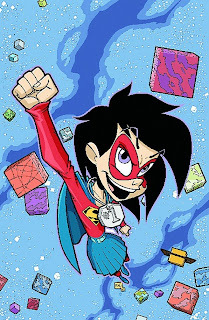 http://www.newsarama.com/comics/010928-Superwoman-Gates.html . While he doesn't go in depth or really provide any new clues, Gates discusses why each one would have a reason to don the cape and cowl. The top 5 candidates by their count were Thara Ak-Var, Karsta Wor-Ul, Alura, Lucy Lane, and Linda Danvers. He also briefly discusses Supergirl 'Black' (the evil clone from the title's first arc), Lara Jor-El, Lyra Kam-Par (Alura's secretary), and Lesla Lar. Here again are the results of the poll run on this blog last month. I admit I did not have Lara or Lucy Lane on the list. And Lyra Kam-Par had not been seen yet. We only have a couple more months to figure this out! Let's keep the guesses coming! I know that none of the comics being reviewed here have anything definitive to do with Supergirl. Still, at least tangentially, they will impact her and the DCU. And they all were good enough to warrant at least a bullet review. 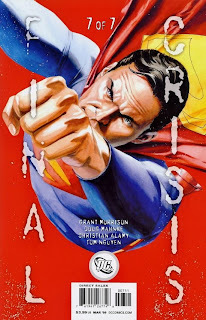 The second part of Grant Morrison and Doug Mahnke's mini-series came out last week and definitely impacts Final Crisis. At last, the main threat of Mandrakk, the Dark Monitor is revealed. 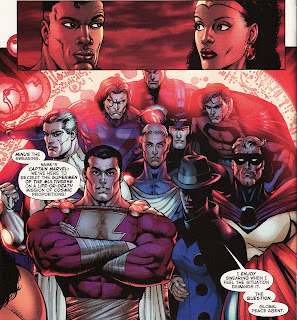 You might recall that last issue the Supermen from multiple universes travelled to Limbo in a Monitor driven ship to help save the universe from destruction. During that trip, Superman read of the origin of the Monitor culture which had been corrupted by the very concept of 'story'. The female Monitor Zillo Valla is able to repair her ship by feeding it Overman's blood. It turns out that the Monitors live off of the bleed, the energy between universes. 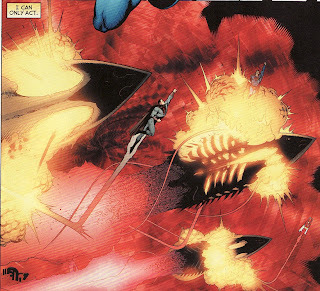 A massive destroyer ship of Mandrakk's shows up in Limbo to destroy it and the Supermen attempt to hold it off. It is then that Superman realizes he needs to inhabit the Superman statue doomsday device created by Dax Novu and hold off Mandrakk himself. 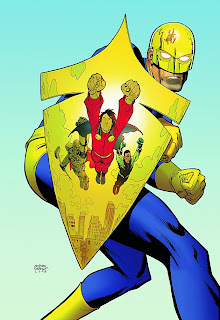 Captain Adam, the Doctor Manhatten-esque Superman, combines the energies of Ultraman and Superman to create a powerful enough quantum symmetry to broadcast the essence of Superman into the thought robot. Superman, inhabiting the robot, is able to walk amongst the Monitors on this world of forms, taking in the massive scale of his surroundings. He learns the thought robot can adapt to fight any threat. He sees how narratives on the 52 Earths have changed the previously immutable Monitor culture. And, he learns that the Monitors are in many ways vampire gods sucking the 'Orrery of Worlds' dry. It is at that point that Ogama, a monitor who had Nix Uotan exiled, reveals himself as an agent of Mandrakk. Mandrakk arises and engages the Superman device. Mandrakk seems unstoppable, wielding unlimited powers and holding a container of bleed energy. 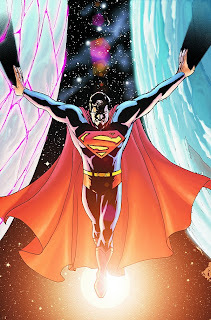 But his every attack is thwarted by the ever-evolving Superman being. 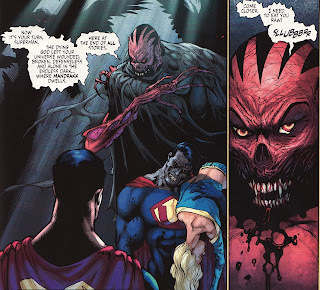 Mandrakk is then attacked by the Superman's origin story - an unstoppable, indestructible, better story than his own. A story as a weapon ... pure Morrison. The battle carries across the landscape with massive damage dealt by both sides. It is then that Superman understands. Mandrakk is the 'opposite of life'. Hmmm .... anti-life? 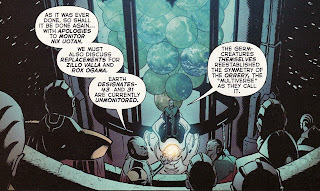 It is also clear that Mandrakk was the first Monitor contaminated by the stories of the multiverse. He is Dax Novu. Mandrakk is cast into the overvoid surrounding reality, engulfed by the over-riding Monitor mind. Superman is able to wrest the vial of bleed from him. He returns to the Monitors where he hears that Ogama will be exiled. Superman and Overman then 'fall' back into Limbo. Superman then leads the Supermen against Mandrakk's destroyer, smashing it to pieces. Victorious, they are all sent back to their home worlds. Well maybe not all of them. Mandrakk and Ogama appear in Limbo and recruit Overman to be their first knight of terror. They vow to fight Superman again, with an army of millions. Back on Earth, Superman reveals that he carried the precious drop of ultra-menstruum, the fluid needed to save Lois, in his mouth. He kisses her and revives her. Superman had taunted by Mandrakk about what he would want carved on his tombstone. 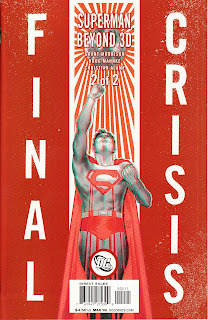 The issue ends showing what Superman had carved on the stone while in the Monitor-world ... the words "To Be Continued." Spectacular! Well, like most of Morrison's works this one is unbelievably dense with abstract ideas and somewhat inscrutable plot twists. Unlike Final Crisis, I was completely on board. This was Morrison at his best, throwing concepts and wrinkles at us rapid fire, hoping we can keep up. In the end, I felt like this was sort of like a David Lynch film. I might not have understood every tiny piece, but I understood enough for the themes to come through. I loved it. I absolutely loved Prometheus when he was written by Grant Morrison in JLA so I was thrilled to hear that Supergirl's Sterling Gates was going to write a one-shot to bring some respectability back to the character. This was a fun read. 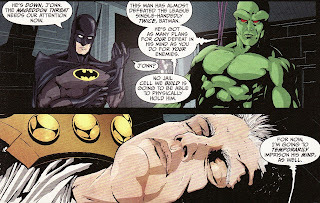 It turns out that after the Mageddon invasion during Morrison's last JLA run, the Martian Manhunter felt Prometheus was such a threat that J'Onn imprisoned Prometheus in his mind. Prometheus was forced to relive his defeat at Batman's hands over and over. This was the one slight slip I thought in the issue. We know how Batman was against mind-wipes in Identity Crisis. Isn't this a bit similar for him to just go along with? 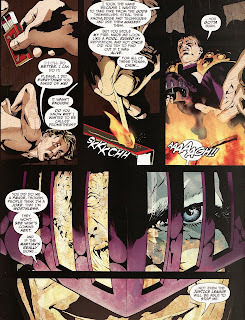 The JLA dumps his catatonic body into Blackgate prison. 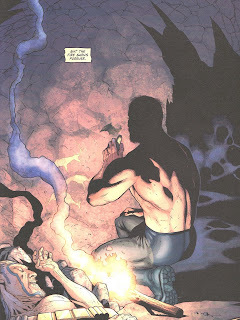 Well, with the death of the Manhunter in Final Crisis, Prometheus' mind became free. He quickly murders his guards and escapes to a safe house of his where he discovers that someone else has been wearing his gear and pretending to be Prometheus in his absence. This phony Prometheus is shown being taken down by 3 D-list heroes ... Anima, Gunfire, and Argus. 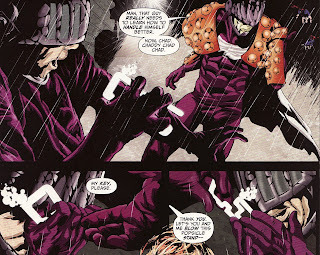 The real Prometheus batters them all with ease, cutting off Gunfire's hands thus robbing him of his powers. He uses his key (being carried by the fake) to transport back to his limbo-like dimension. In teleporting, he kills Anima as he only takes the top half of her with him. The phony Prometheus was a man named Chad who the real Prometheus was grooming to be his 'Robin'. The real Prometheus feels that Chad, who both let Prometheus rot in jail and then proceeded to ruin his reputation, has betrayed him. Prometheus then burns Chad alive. As he laughs with glee, Prometheus realizes that the JLA will underestimate him because of how Chad acted. Prometheus will have his revenge. I think he is supposed to take on the new Justice League (the Hal/Ollie/Kara one) early in that title. So, the whole 'someone else was wearing my suit' story has been done before. But I am just glad that the intelligent, conniving, powerful Prometheus is back. And I think Gates does a good job of re-showing us how psychopathic Prometheus is as he casually kills and mutilates people throughout the issue. I wish I could easily explain why I enjoy Tiny Titans so much. But I flip through every issue and have purchased about half of them. The creators put so much DC Universe history in each story that I think I get a bigger kick out of them than the Supergirls at home do. Take for example the Faces of Mischief cover, instead of Faces of Evil. 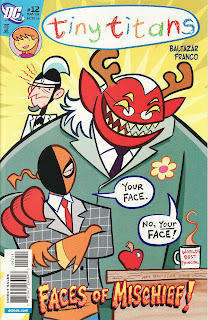 In this issue, Prinicipal Deathstroke and substitute teacher Trigon leave the school with their kids to attend a day baseball game. They decide to leave 'lunch lady Darkseid' in charge as temporary principal. Lunch Lady Darkseid? Awesome. 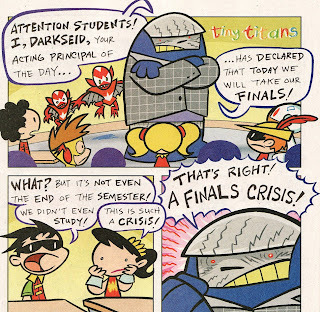 Darkseid decides to make the students take their final exams that day despite it being in the middle of the semester. That's right ... it's a Finals Crisis! That's comedy gold. In another story, Robin is stopped by the hall monitor ... The Monitor. 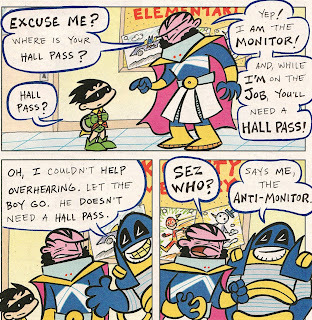 Robin is then told he does not need a hall pass by the Anti-Monitor. The two then argue about whether or not a hall pass is required. At one point the Monitor tells the Anti-Monitor 'everyone likes you more!'. I chuckled out loud. It is hard to grade this comic because of the format. The New York Comic Con is a couple of weeks away and unfortunately I will be unable to attend. At best, I would only have been able to attend for a day. But I was hoping I would have been able to go to shake hands with some of my favorite creators and industry legends. There are sooo many people there I would love to meet - Jamal Igle, Al Plastino, Ted McKeever, Brian Bolland - the list is endless. As usual, a very good friend of mine is going and will try to procure me a couple of commissions. Mr. Igle will be at the top of my wish list. Since I will be getting some new additions to my collection soon, I thought I'd post one I got last year. I try to target artists whose work I really love. A Supergirl commission doesn't always mesh with their particular styles, but I have to say that usually makes for an interesting piece. Take the one above, done by one of my absolute favorites Sean Phillips. Phillips is best known for noirish titles like Sleeper, Criminal, and now Incognito. I love those books. And I love his art in those books. So when he appeared at a New York Comic Con last year, I asked my buddy if he could grab me a commission and I got this great piece. I really think Phillips does great femme fatales - always very sultry. And this Kara is no different. I had an idea what his take on her would be. After all, Phillips did this issue in Peter David's run. Anyways, I will hope to get some new commissions and will scan and post thereafter. April 2009 looks like a busy month for the super-titles. There is also a surprise and a big disappointment. With the economy on a downturn I am lucky enough to not have had to pare down my pull list too much. Hope everyone else is as lucky. “Who is Superwoman?” part 4! Following last issue, Supergirl must decide what to do with a shocking piece of information that casts all of “New Krypton” in a new light! Meanwhile, Lois begins putting together clues regarding the body found in Metropolis Harbor and the strange message it was broadcasting. Well, it looks like we might have an unveiling in this issue. Supergirl certainly looks shocked. But casting all of "New Krypton" in a new light? Who could be behind the cowl that will fulfill that big promise? I don't know what exactly to think of the composition of the cover with Superwoman's posterior so 'in my face', but Kara certainly is beautifully rendered. It’s graduation day, and things couldn’t be more complicated! The whole gang is here, and the cosmic craziness is about to get way out of hand! Talk about the quickest graduation in comics history ... hee hee. Anyways, I love how the cover is the bizarro version of the first issue. And I think Belinda Zee is a complete hoot. So I am happy to see her so prominently displayed. I am sad that this is only a 6 issue mini. Let the barrage of public support for this title be aimed at DC starting now! 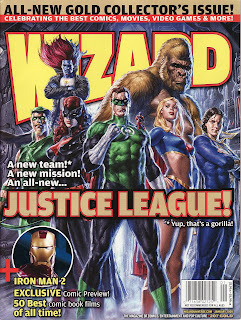 Not much info for this issue which may be because DC isn't ready to share who are inside these costumes. Apparently we learn very quickly in their first solo issue who Flamebird and Nightwing are. I think I am going to hold off on my expectations about this title until I hear about who the heroes really are. Mon-El has agreed to be Metropolis’s new champion – unfortunately Metropolis wants nothing to do with him! In the wake of the events in the “New Krypton” saga, Mon-El faces fierce anti-Kryptonian sentiments from a city that assumes he’s Kryptonian. Oh, and there’s also the not-so-small problem of Rampage. Meanwhile, the Guardian and his Science Police must deal with the Prankster’s new wave of murderous fun. And Black Lightning and Steel face the repercussions of a world without Superman. I have to say I am just not a big Guardian fan. And I don't think I know enough about the current Mon-El to say if I am excited about a title involving him as well. I most likely will buy the title for at least the first few issues since it will impact the Super-titles. I trust Robinson to keep me coming back for more. Superman thought that joining his people on New Krypton would allow him to ease some of the tension between Earth and his people, but lately nothing’s been easy for the Man of Steel! 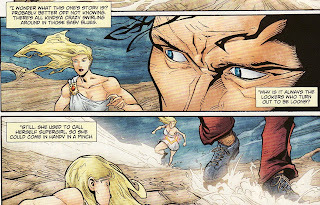 Alura still shows no signs of becoming the kind of leader Superman wants her to be. The people of New Krypton still don’t understand the responsibilities that come with their new abilities. And as for Zod? Superman doesn’t even know where to start with Zod. All The Man of Steel knows is that he can’t be trusted. And Zod is about to prove Superman right. So only two issues in and we see a Superman/Zod confrontation. I am filled with anticipation for this miniseries to see if this gives a more complete wrap-up of the New Krypton storyline. I mean, we can't have a planet full of Kryptonians in the DCU solar system forever right? One thing that does stand out is the writing credits. Robinson and Rucka? I thought Kreisberg was the writer for the whole series. Is this a mistake? A re-write? Or is the series a joint effort from the entire creative team? When the alien Kanjar Ro invades Earth, he freezes all humans so that they won’t mess with him – including the Super Friends! What he doesn’t know is that he’s about to face resistance from their super best friends – the Super Pets! It seems that Streaky remains as powerful a force in the DCU in 2009 as he did in 2008! I can't get enough super-cat. 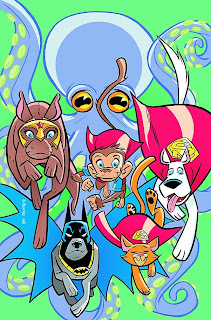 And while I recognize Ace, Krypto, and Beppo ... I don't know what to make of the Wonder Kangaroo? And art by Scott (Captain Carrot) Shaw! Perfect. I guess I will have to buy this issue. Will this title ever come out? It was announced last May (I think). I just wish DC would come out with a statement about it. Has it been scrapped? Do they have a ballpark guess as to a release? Summer? Fall? DD: Sure – right now the Justice League story that he’s telling, because of the quality of the painted art that we’re getting, it’s moving slowly. Again, we’re very conscious of our schedules and putting books out on time. We’re also conscious of the fact that we made a mistake in getting out a little too early with this book. We were all excited that James was working on a Justice League project, so we got it out there probably a little too early for our own good, and we’re going to be a little more judicious on how we release our information. I don’t want to get everybody overexcited about it, but the book is on its way. Looks like they may be waiting to get a number of issues 'in the can' so they don't have delays. I guess I can deal with that. 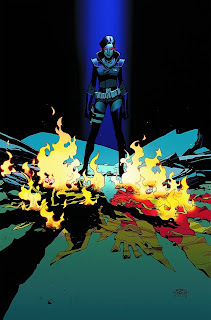 But at what point do they simply put the fire to the creative team to get moving .... or pick another artist (despite the wondrous Cascioli art). Anyways, looks like a good month! Looking forward to seeing the face under the Superwoman mask at last.